Shimano's Tiagra Conventional 2-Speed Saltwater Reels deliver the smooth and unrelenting power today's performance-minded big game fisherman rely on. Every Tiagra Conventional Saltwater Reel is machined from solid 7mm pipe stock aluminum for relentless strength and secure alignment under duress. Features smooth push-button shifting backed by permanently lubed A-RB Anti-Rust Bearings for easy handling at all times. 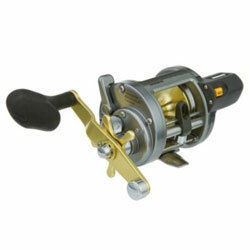 "If you like to tackle BIG fish with light gear then you've got a give this reel a try. Before the advent of spectra, anglers were forced to use bigger heavier reels in the 30-80 size to accomodate line capacity. I was able to get about 400yds of 80lb spectra and still had room for about 100yds of 60lb mono." "I used the biggest one of this set of reels to catch tiger sharks of the east coast. I landed a 2,500 lb. one on this reel. It's the best and the toughest money can buy." "i landed a 100 lb white marlin with this reel and it did a heck of a job. i feel that it could have fought a much bigger fish too."